Seattle is that rare location where it isn’t trite to make conversation about the weather. Right now it’s that time of year where elsewhere in the world the sun is beginning to shine again, but in Seattle the sky is still a solid grey. SAM Gallery artist, Laura Van Horne doesn’t mind the muted monochrome of Seattle in the spring. Instead, she feels it is the perfect backdrop for the colorful paintings she currently has on display at TASTE Café. Learn more about the artist and see her paintings on view through May 6. If a pop of color is what you need in your life right now, consider renting or buying art from SAM Gallery. I grew up in Winnipeg, Manitoba, Canada and moved to Seattle, WA in 1994. During my schooling I spent several winters in North Dakota, Boston and New York, so was thrilled to move to mild-weathered Seattle. 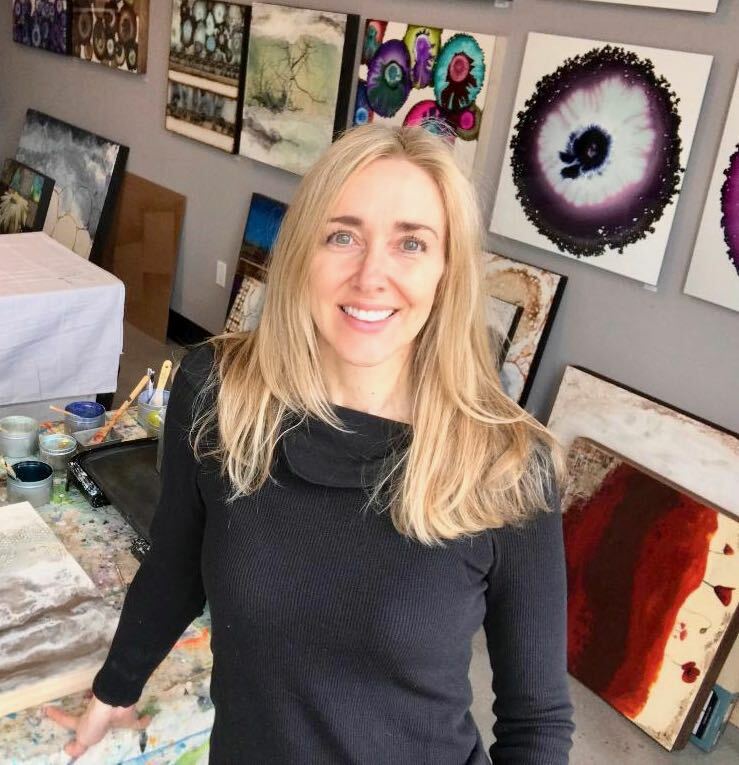 I am not bothered by the rainy season here in the Pacific Northwest, as it gives me a perfect excuse to spend the day inside, painting at my studio. I feel my work is greatly influenced by my surroundings. Living in Seattle is breathtakingly beautiful. I love to go for walks and photograph everything around me, and am especially drawn to the trees, which frequently show up collaged into my encaustic paintings. My body of work is often abstract and landscape inspired with lots of layering. The Geode Series, which is on display now at TASTE Café in the SAM is packed full of color which is in contrast to the gray palate of Seattle. Gray is the perfect backdrop for these pops of color. These abstract paintings have evolved from years of experimentation with an elixir of inks, pigments, paints, and resin used on a variety of substrates. The result appears organic and scientific with geodes, human cells, irises and orbs coming to mind. 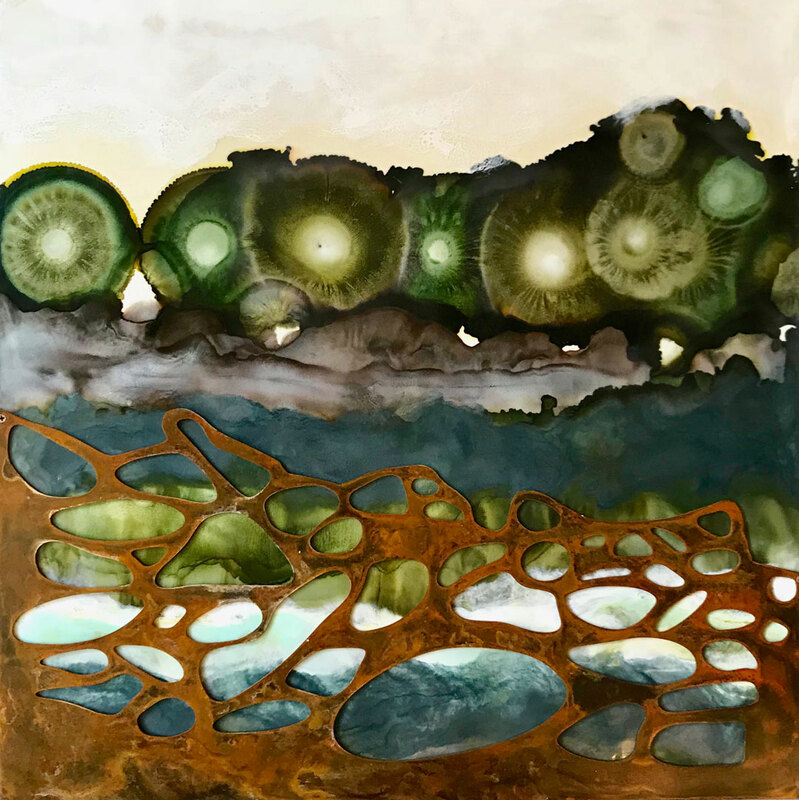 Images: Kiwi Cocktail, 2018, Laura Van Horne, encaustic, ink, metal on board. Courtesy of the artist.